Colts vs. Patriots. Manning vs. Brady. Its the quarterback duel of the past decade. Where Peyton Manning has 4 MVPs and one championship, Brady has won 3 Super Bowls and one MVP. The argument of who is better will never end, as it really depends on what criteria you use to measure a QB's value. But Manning is 34, and given his immobile nature, it's hard to see him playing as long as Brett Favre. This rivalry is likely approaching its final years. 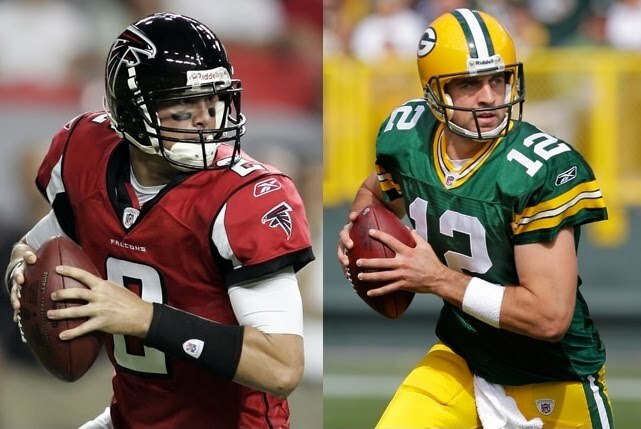 After last week's thriller between the Packers and Falcons, the discussion arose in the national media: is this the next great rivalry? Each team seems to be built to last, and Aaron Rodgers and Matt Ryan are rapidly working their way into the top-5 QB discussion. The comparison is interesting because of how the game went. Rodgers was in the Manning mold as the stat machine and field-general, right down to the no-huddle offense and line of scrimmage play-changes. Meanwhile Ryan was very Tom Brady, playing fully within the confines of the gameplan, never flashy, and always taking what the defense gave him. You knew he was capable of more, but he knew how to win. While the Falcons came out on top, the Packers were much flashier on offense. Rodgers repeatedly completed big time passes and made plays with his legs. The touchdown he threw to Jordy Nelson on 4th down was as big a play as he's made in his career. Rodgers played so well that McCarthy said, "I've never seen a quarterback in my time play to that level in the passing game." This in a losing effort. What can we as fans take from this? The defense played admirably--keeping the Falcons to 20 points should be good enough to win--so the points lost on Rodgers' goal-line fumble were the only difference here (its worth noting that the Falcons marched 80 yards and scored to end the half, making this a potential 14-point swing). If McCarthy is right about the game Rodgers played, it seems that the outcome was inevitable. With a weak running game, the Packers live and die in the hands of one man, while the Falcons are a fully loaded team. If you put the ball in the hands of one person enough times, odds are he'll slip. So it seems that the Falcons have the edge on Green Bay, and it's really too bad, because our version is much more fun to watch. But the final question is: what matters more, entertainment value or wins? The answer to that is easy because style points don't count. But before we go hanging our heads in defeat, let's return to Peyton Manning. 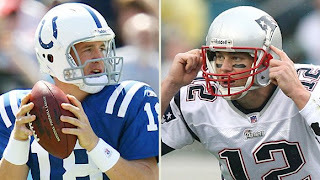 When Manning entered the NFL Draft in 1998, the big question wasn't Manning or Brady, but Manning or Leaf, as in colossal bust Ryan Leaf, who was drafted after Manning by the San Diego Chargers. The two were pitted against each other in the media like heavyweight boxers prepping for a title bout. Every detail of their games was scrutinized and compared against that of the other's, with the final question always being, "which one will go #1?" This Sunday the Packers host the San Francisco 49ers, not-so-proud owners of former 2005 #1 pick Alex Smith, who has turned out to be the Leaf to Rodgers' Manning. Though Smith hasn't been a failure of Leaf's caliber--he matched Leaf's career total of 25 games played in his second year--he certainly hasn't lived up to his draft-day billing. Having lost his starting job this year yet again, this time to the underwhelming but effective Troy Smith, his injury-riddled career as a 49er seems to be all but over. Given that perspective, I'm pretty happy with our Manning clone. He's a dynamic player who will always keep a team in a game and has proven himself capable of greatness. Say the Manning-Brady comparison plays out to the very last detail. There will be plenty of frustration in constantly playing second fiddle to Matt Ryan's Falcons. But if there are 4 MVPs and a Super Bowl victory in there, would anybody complain? Female Escorts If you come to the current technique at a later age, you wish to cultivate a replacement set of skills, simply as I did. Get skills that suits this alteration and direction you may be taking and find a approach to blend them along together with your previous skills.